Rajasthan’s rich culture is manifested via its majestic forts, royal palaces, vibrant festivals, performing arts, and even traditional costumes. The traditional Rajputi Poshak is colorful and elaborate and is still proudly worn by Rajput’s. 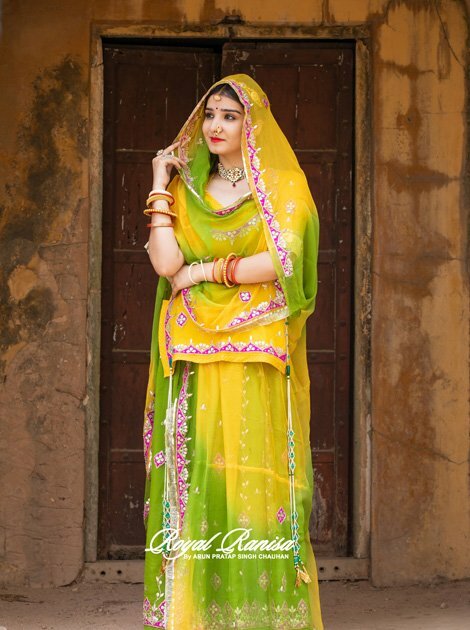 Every Rajput woman adores the grace and elegance of a Rajputi Poshak that offers them a gorgeous look. Therefore the poshak has a natural recognition as the attire of the Rajput women. The women of Rajasthan, extremely like the region itself, is wrapped in color and tradition. This is reflected in their energetic dress and ornamentation. For centuries, the Rajputi dress most widely worn by the women in Rajasthan has been a combination of an upper garment kanchli and kurti, a lower garment(Ghaghra) and the odhani, wrapped to flow across the upper and lower parts of the body. In addition to above, there are numerous diverse and additions to the ensemble across and within communities, depending on the social position of the wearer. However, these three items of Rajputi dress are the basic traditional garments worn by Rajputi women in Rajasthan even today. The kanchli is an upper garment, worn by Rajput’s ladies in most communities in Rajasthan. The fascinating choli or kanchli sits snugly on the curve of the chest and is the finest example of the technical understanding of molding a flat two-dimensional form, the fabric, on a three-dimensional body. However, these kanchli, choli or kurti are Colorful and intricately designed and shaped as per the specific body measurements. In order to have a traditional touch, they are adorned with mirror-work, kundan work, Gotta Patti, beads and sequins, coral and shells, and creative-cut work. The kurti is an uppermost garment that is worn in combination with a kanchli. This Dress is about 200 years old. The kurti is usually a sleeveless garment. Depending on the regional style the skirts in India is known by various different names. In Rajputi Poshak, the most popular by far being the ghaghra. The ghaghra is actually a long skirt, which has the form of a simple gathered skirt or a flared gored skirt. 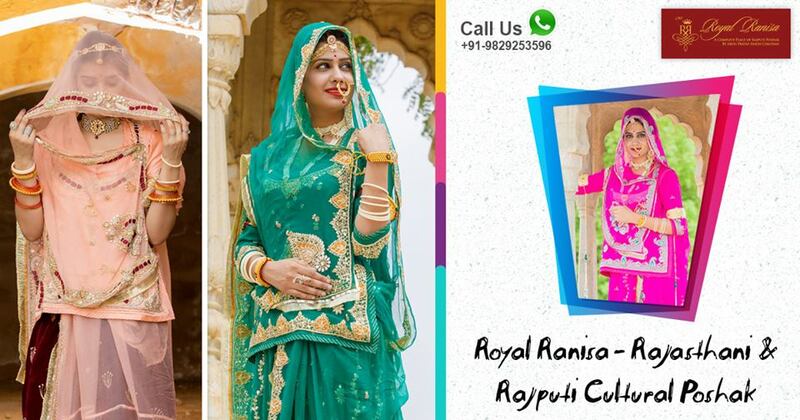 Royal Ranisa Provides the best Rajputi Dress in Jaipur at an affordable price. The ghagra covers full legs, embroidered and pleated skirt. Royal Ranisa provides a variety of colors, prints, and fabrics, such as silk, cotton, georgette, and crepe. We have a large collection of the Rajputi Poshak in different colors and different pattern. The odhna or odhni is a visor and represents the continuation of an unbroken tradition of wearing unstitched lengths of fabric. It was adopted as the most preferred style of clothing by the ancient people of India. In addition to above, it is made of lightly printed or patched fabric, it features Beautiful embroidery, beadwork or other embellishments. Poshak is typical but quite pretty. However, you can choose it for the grand occasion like marriage. 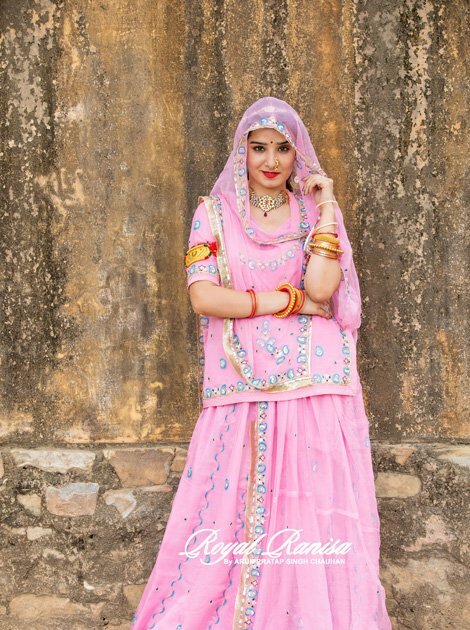 The Royal Ranisa brand has been one of the best one-stop destinations who serve the community of the Rajput women worldwide, bringing them a huge Collection of this wonderful Rajput dress in the best colors and designs. The Royal Ranisa brand has been one of the best one-stop destinations who serve the community of the Rajput women worldwide.